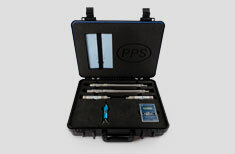 Click here for more details about the new PPS Advanced Technology SOI sensor. The PPS25XM SOI-V1 Extreme Memory Gauge features an advanced piezoresistive pressure transducer, high temperature electronics technology and a welded housing in order to maximize the gauge’s performance in high pressure and high temperature well conditions. The new technology PPS SOI sensor is used in many oil and gas projects run by our customers because this state of the art SOI sensor can be used in hazardous environments without worrying about failure. If the gauge is used in high concentration CO2 or H2S the reinforced metal to metal seals prevent leaks, creating long term stability and reliability in extreme corrosive environments. Reliability, accuracy and flexibility in E-beam welded package designs and OD sizes are the cornerstone of our innovative products. The SmartView software has a very user friendly interface, so operators with minimal experience can feel confident running the gauges and retrieving data. Also once the gauge is programmed with the desired sampling rates and durations, jobs can be run consecutively without needing to reprogram the gauge, saving time onsite.